In Australia, depreciation claims can make a significant difference to a property investor’s cash flow. Despite this fact, of all the tax deductions available for investors to make a claim for their property, depreciation is the one most often missed. Recent statistics from the Australian Taxation Office (ATO) suggest that only 30 per cent of property investors claim depreciation for available capital works deductions, and just 18.75 per cent claim the depreciation of plant and equipment assets. This is quite a significant number of investors who are missing out on thousand of dollars they are eligible claim. So why are Australian property investors failing to claim the depreciation deductions they are entitled to? According to Bradley Beer, The Managing Director of BMT Tax Depreciation, there are a number of reasons. “One of the main reasons investors fail to claim depreciation is because they don’t need to spend any money to be able to claim it. As a non cash deduction, investors are often unaware that there are already deductions available to claim for the existing building structure and plant and equipment assets contained within the property,” says Bradley. “Another mistake property investors make is to assume they’re ineligible because they own an older property, or they may have only recently purchased their property and think because of the short term of ownership it is not worthwhile making a claim. 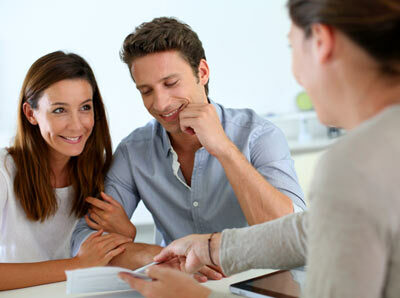 The reality is, it is worth making an enquiry for any property,” said Bradley. For those investors who are unaware of what depreciation is and are wondering how to go about making a claim, we’ll explain. ATO legislation allows the owner of any income producing property to claim a depreciation deduction for the wear and tear of a buildings structure and the plant and equipment assets the building contains. To claim depreciation, investment property owners should contact a reputable Quantity Surveyor that specialises in depreciation. In Australia, the ATO recognise Quantity Surveyors under Tax Ruling 97/25 as one of the few professionals with the appropriate construction costing skills to estimate building costs for depreciation purposes. The Quantity Surveyor will arrange for one of their specialist staff to perform a site inspection of the property to take measurements, adequate notes and photos of all of the plant and equipment assets contained in the property. This information will then be collated to put together a tax depreciation schedule which outlines all of the claims available for the owner for the life of the property (40 years). The property owner’s Accountant will then be able to use this information to process a claim when they complete the investor’s annual tax assessment. 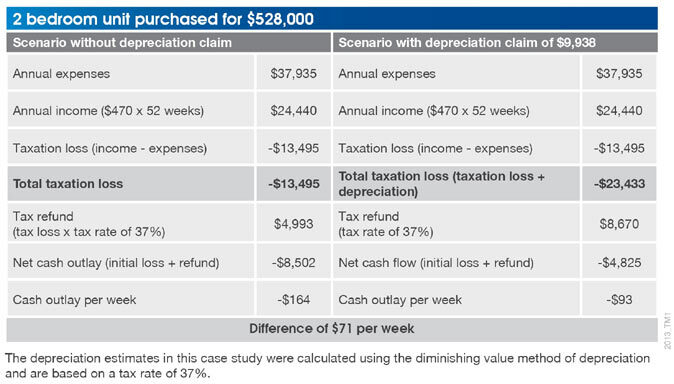 The following scenario shows how a property investor’s cash flow will be improved by claiming property depreciation. Margaret purchased a two bedroom apartment for $528,000 one year ago. Her property was then rented for $470 per week, with a total income of $24,440 per annum. Expenses for her property including interest, rates and management fees totalled to $37,935. After calling BMT Tax Depreciation, Margaret found that she would be able to claim $9,938 in depreciation deductions. The following scenario shows Margaret’s cash flow with and without a depreciation claim. Before claiming depreciation, Margaret would experience a loss of $164 per week for the first year of ownership for her property. Simply by claiming depreciation, Margaret was able to turn her cash flow position into a more positive one and reduce her loss to just $93 per week. In total BMT Tax Depreciation were able to save this investor $3,692 in just one year. The BMT Tax Depreciation Calculator is a useful tool for investors to calculate the likely depreciation deductions available for any property. To download the Tax Depreciation Calculator for your iPhone or Android phone, simply click here. Alternatively, you can use the depreciation calculator online simply by clicking here. BMT Rate Finder helps property investors and their Accountants to find out the effective life and depreciation rate for any plant and equipment asset that may be contained within any type of investment property, whether the investment property is used for commercial, industrial, manufacturing, retail or residential purposes. Using Rate Finder you can search by industry or asset to find the effective life and depreciation rate of an asset for both the prime cost and diminishing value methods of depreciation. To download Rate Finder for your iPhone or Android phone, click here. Alternatively, to use Rate Finder from your desktop computer, simply click here. BMT Resi Rates helps investors to find out the effective life and depreciable rate of any plant and equipment asset contained in a residential property. Resi Rates aims to assist Property Managers and property investors alike with disputes over damaged assets, and can assist with maintenance and replacement scheduling. To download BMTresirates for your iPhone or Android phone, simply click here. Australian property investors who have any further queries about the depreciation deductions for their property or who would like a free over the phone estimate of their available deductions should contact BMT Tax Depreciation on 1300 728 726. Bradley Beer (B. Con. Mgt, AAIQS, MRICS) is the Managing Director of BMT Tax Depreciation. Please contact 1300 728 726 or visit www.bmtqs.com.au for an Australia wide service.